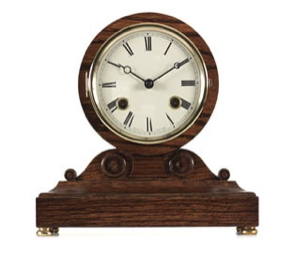 ‘The Scroll’ English made solid wood mantle clock with a bell striking 8-day mechanical movement by Hermle of Germany. W0130-070 movement. 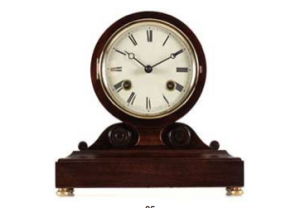 Ivory coloured dial with black Roman numerals. Solid brass bezel. Four solid brass feet. Approx Dim. 21cm x 21cm x 9cm.